Apple on Thursday pushed out a minor update to its iOS 7 mobile operating system, addressing an issue that would cause FaceTime calls to fail for some users, along with squashing other bugs. iOS 7.0.4 is now available for iPhone, iPad and iPod touch, and is identified as "build 11B554a." It can be downloaded via the Software Update section of the native Settings application in iOS. 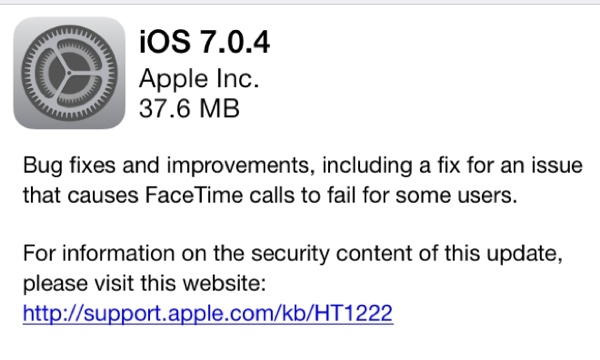 Apple's official release notes state that the update includes "bug fixes and improvements, including a fix for an issue that causes FaceTime calls to fail for some users." The update applies to the iPhone 4, iPhone 4S, iPhone 5, iPhone 5c, and iPhone 5s; the iPad 2, third- and fourth-generation iPads, iPad Air, iPad mini, and iPad mini with Retina display; as well as the fourth- and fifth-generation iPod touch models. Also on Thursday, Apple released a software update for its Apple TV set-top box. Apple TV software version 6.0.2 is now available for download. Finally, for users of the fourth-generation iPod touch, which cannot run iOS 7, Apple has also released iOS 6.1.5 to address FaceTime issues on that device.